Revolut has become the latest company to poke fun at its own customers. This needs to stop now, says Felicity Hannah. There’s a trend in advertising and, for me at least, it’s a worrying one. I first noticed it in 2017, a coy tweet from Netflix. It was quite funny and it didn’t seem to be malicious but it made a lot of people uncomfortable. It was gentle joking, but the joke was very much on a small group of customers – and the close analysis of data made a lot of people uncomfortable. Spotify also launched an ad that made a similar use of its customer analysis. Both of those adverts used customer data in a very frivolous way. Some people felt uncomfortable but the companies didn’t seem to be using it unpleasantly at least. Hold my beer, said challenger bank Revolut. 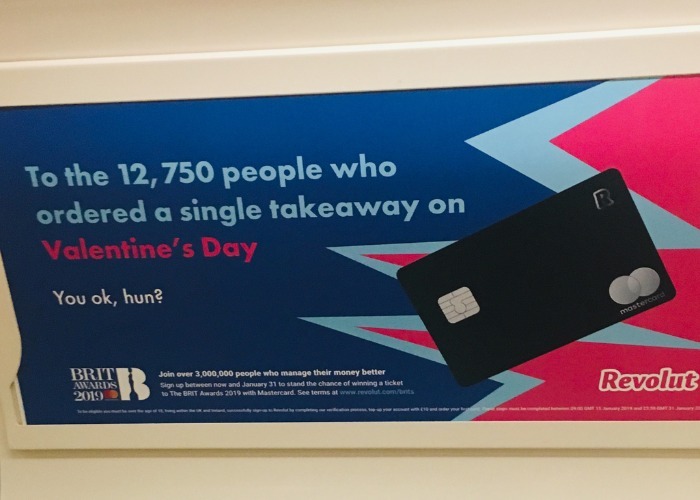 It has launched a new advertising campaign across the London Underground that appears to specifically both their customers and anyone who is alone on Valentine’s Day. “To the 12,750 people who ordered a single takeaway on Valentine’s Day. Wow. Extremely dubious use of data. Mocking customers. Laughing at anyone who, for whatever reason, is alone on Valentine’s day. First of all, there is nothing to be ashamed of in being alone on Valentine’s – and this advert makes it seem like there is. People might be single and treating themselves. Why the hell not? They might be alone because their partner is working in an essential sector. People might be alone because they are widowed or their other half is in jail or in hospital or any number of reasons. Why the hell can’t they order a takeaway without being insulted on billboards on their commute? Secondly, it’s a really dubious use of data. Companies will collate data, I understand that. They will use it to develop products, they will use it to market to us, they will use it to inform their various campaigns. However, to use it to mock and disparage people for ordering a takeaway – like a classroom bully – is really rubbish. And it also adds to the sense that being single or alone for whatever reason is shameful, and it isn’t. It’s just mean to put up massive posters suggesting that it is, it’s tone deaf. But it’s also just bad marketing. People have arguably never been so aware of how their data is being collected and analysed. Since Facebook was exposed for enabling the collection of our data on such a grand scale, people have been increasingly thoughtful about what data they are handing over and how businesses are then using that data. Companies that collect customer data need to be extremely respectful of that new hesitance. Transparency is important. Security is important. Respect is important. Is there anything more disrespectful than analysing that data for LOLs? For using existing customer data to laugh at their own customers in order to try and attract new customers. No, I don’t think there is. So is what Spotify and Netflix did alright? Until the Revolut advert, I was still working out what I think about this kind of flippant data use. It’s an emerging area, it’s not always immediately obvious where the red lines should be. I definitely believe that using data to cruelly mock people who are alone on Valentine’s is wrong. But what about gentler, less cruel jokes like Spotify’s? They may not be cruel, but I do now think they are problematic. After all, it matters that we know businesses are treating our data properly. It matters that we know they are only using it when they need to, not sniggering at it in public. It matters that businesses know that we need to trust them if they are going to have access to such complex and complete data profiles of their customers. It matters that data is respected for what it is – access to our habits and our preferences. It is valuable, it is an insight into our lives that we have trusted companies with. It is not a free-for-all that gives them permission to trawl the information for fun and for advertising. This is not an okay marketing trend. And so it doesn’t matter whether it’s Netflix, Spotify, Revolut or any of the other brands that think they are so cheeky and fun to make use of customer data. It’s not funny and it could be harmful. At very least, it suggests that customers should think carefully before sharing data with them. What do you think? Is this just harmless fun or a genuine issue? Should people be put off businesses that advertise using their customer data this way or is it just genuinely funny? Vot in our poll above and explain your view in the comments section below.